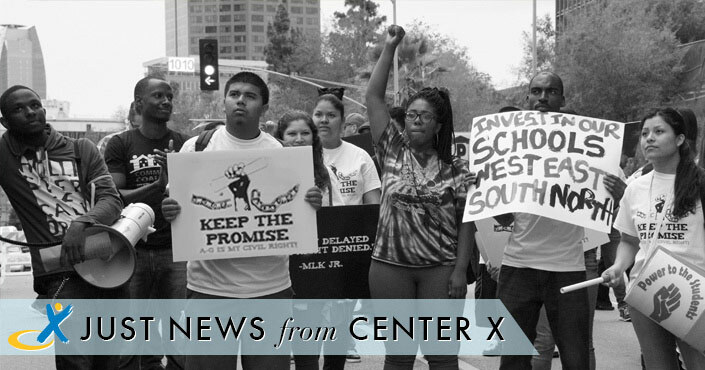 Just News from Center X is a free weekly news blast about equitable and inclusive public education. Please share and encourage colleagues and friends to subscribe. “I’m a teacher,” I mumble under my breath. The instructor yells another command, and we collectively pull our triggers, setting off an angry crackle of handgun fire. Twenty-three paper intruders recoil quicker than senses can register. The entire scene has the atmosphere of sport; the targets do not bleed or shoot back. Squinting through the sun’s glare, I look for the impact point, the void that would bleed the life from my hypothetical foe. “This person is killing your students!” an instructor berates, fuming at our inadequacy. The humanoid targets are faceless, sexless, standing over six feet tall. An hour before, the instructors informed us that most school shooters are male students. But few students, even high school males, are this tall. On the range this comparison is unspeakable, but I can’t shake the thought: we are being trained for the contingency that we have to kill a student. Democrats in the House and Senate introduced legislation Thursday intended to clarify that the Department of Education cannot allow school districts to use federal funds to arm teachers. “The last thing our classrooms need is for schools to be loaded up with weapons,” Sen. Chris Murphy, a Democrat from Connecticut, said at a press conference Thursday. “That terrifies children who are already living in fear of being the next victim.” The bill is a direct rebuke to Secretary of Education Betsy DeVos, who last year considered whether to allow states to use a program in the federal K-12 law to pay for firearms and training for school staff – a move prompted by an inquiry from education officials in Texas who wanted to do so. DeVos later said she was not actively looking for ways to allow states to use federal dollars to arm teachers, but the policy of arming school personnel was one of nearly 100 recommendations included in a federal school safety report issued by the White House in December. Principals are vital for ensuring student success. Their actions help maintain a positive school climate, motivate school staff, and enhance teachers’ practice. Therefore, they play a major role in retaining effective teachers and ensuring their success in the classroom. Ultimately, principal leadership has significant implications for students’ experiences and accomplishments. Research notes that principal turnover can be disruptive to school progress, often resulting in higher teacher turnover and, ultimately, lower gains in student achievement. Further, the relationship between principal turnover and declines in student outcomes is stronger in high-poverty, low-achieving schools—the schools in which students most rely on education for their future success. As children in the U.S. woke up and went to school Friday morning, the world was grappling with the news of the mass shootings that killed 49 people at two mosques in New Zealand. “It’s absolutely necessary that we don’t wait until we have horrific situations like this…to pay attention to” the issue of hate, said Abbas Barzegar, director of the Department of Research and Advocacy at the Council on American-Islamic Relations, in a news conference. Citing data showing “a consistent rise” in anti-Muslim and anti-Semitic bias incidents and hate crimes around the world, he stressed that even events or talk that seemed “banal” should not be ignored or brush aside. “Right now it seems to be the case that we only look at fires, but we smell the burning smoke from miles and miles away, and we ignore it,” Barzegar said. The white supremacist ideology that appears to have fueled Friday’s attack knows no borders, but schools around the U.S. are working to identify and stop it from entering their doors. More than 10 percent of the 7,175 hate-bias incidents reported by law enforcement in 2017 occurred at schools and universities, a roughly 25 percent increase from 2016. According to the data, hate crimes occur more often at schools than at places of worship, government buildings or commercial offices. When Joyce Ponce used to teach Head Start preschool programs in Santa Clara County, she taught in English, though many of the children in her classroom spoke Spanish or Punjabi at home. “I noticed the kids who did not understand English were just sitting off to the side, but the moment the assistant would come and speak their language, they blossomed, their eyes opened up,” Ponce said. Ponce, now a coach for other Head Start teachers, is one of hundreds of preschool teachers and supervisors across California who are getting training this year on how to support children whose families speak a language other than English at home. These students account for 60 percent of children under 5 years old in the state and are often referred to as “dual-language learners” because they are learning two languages as they grow — their home language and English. For the first time, a California governor has created a position in his office focused on early education. Gov. Gavin Newsom appointed Giannina Pérez as his Senior Policy Advisor for Early Childhood. Peréz previously worked for Early Edge California and Children Now, both well-known children’s advocacy organizations. As an advocate, she worked to expand training for preschool teachers and child care providers to better support children who speak languages other than English at home. She also has experience in the state Legislature, having worked for former state Sen. Hilda Solis and Assemblywoman Cindy Montañez. She has a master’s degree from UCLA’s School of Public Affairs. Pérez spoke with EdSource recently about her new job and ideas regarding early childhood in California. The interview has been edited for length and clarity. The assembled 2- to 4-year-olds are halfway through a lesson about walking slowly, not rolling around on the floor when a teacher is talking, and how to identify different parts of the body (the “tummy” is a big hit), when a piercing wail comes from upstairs. “That’s my little Sam,” says Nancy Harvey, the owner of Lil’ Nancy’s Primary Schoolhouse in West Oakland. “Sam…he keeps us going.” Sure enough, Sam, who is being watched by one of “Miss Nancy’s” assistants in the infant room upstairs, is fussing. Though happy enough to squirm around on the carpet and practice his crawling skills, he is failing to embrace nap time. Learning to sleep when you’re tired can be a challenge if you’re less than 12 months old. Teaching a dozen children to nap, read and make friends every day for 15 years might be even harder. Of this crop of preschoolers—nine in the classroom plus three toddlers napping (or not) upstairs—four come from families who are receiving state assistance. And that ties Harvey’s financial fortunes to the political and budgetary vagaries of Sacramento. “I cannot offer a livable wage because the reimbursements are so low,” she said of her three aides. “Women and men in this field don’t have decent retirement. Many don’t have anything. I don’t have anything.” So Harvey, a small business owner, is hoping to join forces with an unlikely ally: organized labor. Next week the Trump Administration will show us, once again, how far it will go to protect polluters at the expense of children’s health. On March 26, the 9th Circuit Court of Appeals in San Francisco will hear, for a second time, arguments over a proposed ban on chlorpyrifos, a pesticide toxic to children’s developing brains. Lawyers for the U.S. Environmental Protection Agency (EPA) will once again make the case for keeping the chemical on the market. And NRDC, Pesticide Action Network (PAN), and public health, farmworker, and environmental advocates, represented by Earthjustice, will be arguing the court should uphold a ruling it made last August that ordered the chemical banned from use on U.S. food crops because of the risk it poses to kids. This hearing will be the latest development in long-running legal battle over chlorpyrifos that began when NRDC and Pesticide Action Network (PAN) petitioned EPA to ban the chemical in 2007. While the agency was close to finally doing so at the end of 2016, the Trump administration (which has close ties to Dow Chemical, the largest manufacturer of chlorpyrifos) reversed course just a few short months after taking office. Next week’s hearing will come just days before the two-year anniversary of their refusal to ban it. Governor Newsom has set a bold vision for California, which includes alleviating child poverty, preventing homelessness and strengthening affordable housing. Taking on these issues may seem overwhelming, but there is good news: an existing model in our backyard can help make progress on all three of these challenges. It all started with a simple idea. We know that afterschool programs make a difference: kids have better school attendance, stronger social-emotional skills and graduate at higher rates. At the same time, kids who live in affordable or public housing developments are often the most vulnerable and fall through the cracks. So, what would happen if we brought afterschool programs directly to housing developments where students live, rather than only offering them on school campuses? It’s been one week since federal authorities announced that 50 people — including actresses Lori Loughlin and Felicity Huffman — participated in a massive scam focused on getting wealthy children accepted to elite universities. The scandal has sparked an intense discussion about wealth, privilege, and access to America’s most selective schools. But the ongoing fallout, and other recent stories about race-conscious admissions at Harvard and growing racial disparities in New York City’s selective high schools, provide a chance to examine a larger issue: how racial, educational, and economic inequality and discrimination collide to create a system where low-income students of color — particularly black and Hispanic students — struggle to access a quality education. Applying to attend the country’s No. 1 public university doesn’t just mean being a student. Sometimes, it also entails beating a system meant to work against you. The phrase of the day is standardized tests. Standardized tests like the SAT are required of students all over the world hoping to be admitted to the University of California and UCLA. Since its start in 1926, the SAT has been used by universities to set standards of not just what is expected of applicants, but also to determine whether a student is ready for college. But these tests offer a limited insight into students’ potentials. There are numerous financial barriers to taking tests like the SAT, including registration costs, fees associated with sending scores to universities and tuition for prep courses. Students coming from low-income homes often are unable to afford these expenses. The UC is now, at the request of President Janet Napolitano, studying whether standardized testing is an accurate predictor of success in college. But we already know what the results will be. States have never found so many homeless students in public schools before. The next challenge will be finding ways to keep those students in school long enough to earn a diploma. Nearly 1.36 million children—more than all the students in New York City—went to school in 2017 without knowing where they would sleep at night, finds a new report by the national campaign Education Leads Home, which looked at new national data as well as graduation rates for homeless students in 26 states. That’s a jump of more than 100,000 students from 2016, making 2017 an all-time high since the group began tracking in 2007. “Homelessness is not just not having housing. … It goes above and beyond poverty,” said Barbara Duffield, the executive director of SchoolHouse Connection, which co-wrote the report with three other groups, the America’s Promise Alliance, Civic Enterprises, and the Institute for Children, Poverty, and Homelessness. “There’s so much that goes into homelessness, in terms of trauma … these students have multiple risk factors.” The report found that nationwide, only 64 percent of homeless students earn a high school diploma, and there is a wide variation from state to state in what percentage of homeless students complete a high school diploma. That’s nearly 20 percentage points lower than the average graduation rate for all students, and nearly 14 percentage points lower than the graduation rate for students who are living in poverty but have stable housing. Elementary school enrollment patterns in New York City’s most rapidly gentrifying areas have seen a decline in racial segregation, according to a new report released today by the UCLA Civil Rights Project. And the declines are more evident in traditional public schools (TPS) than in charter schools. Gentrification in the nation’s urban centers has surged over the past couple of decades and is transforming New York City neighborhoods. The report, School Integration in Gentrifying Neighborhoods: Evidence from New York City, finds the White population has increased almost threefold in the city’s most rapidly gentrifying neighborhoods, from 11% in 2000 to over 30% in 2016. In these same rapidly gentrifying areas, the share of White and Asian enrollment in public elementary schools increased by almost five percentage points between 2001 and 2015, rising from 5.7% to 10.4%. In 2015, nine of ten elementary charter schools in the city’s most rapidly gentrifying areas were intensely segregated, and three of four charters were hypersegregated, enrolling 99-100% non-White students. For elementary TPS, 79.5% were intensely segregated, but a much smaller share (28.2%) was hypersegregated compared to charters. Fewer “no excuses” and for-profit charter schools are getting the green light to open, according to a report offering a fresh look at the state of the charter school movement. The analysis comes from the National Association of Charter School Authorizers, which represents the entities that approve and oversee charter schools — usually local school boards, state boards, or universities. The report draws on five years of charter school proposals submitted to most of those authorizers in 19 states and Washington, D.C., looking at what kinds of schools were proposed and which ones got approved. “The data reveals the significant impact authorizers have on shaping educational opportunities, as the schools getting approved do not reflect the full variety being proposed,” the report says. Here are a few data points that stuck out to us. Keep in mind that the report can’t explain what’s behind different trends, and it doesn’t address larger debates about the merits of charter schools. And although it looks at a large swath of charter applications, it doesn’t include all states or authorizers. Who are the students attending charter schools with low graduation rates? In nearly 1,000 public high schools, less than half of all students graduate on time, according to a recent Education Week analysis of federal data. And more than half of those high schools are charters. So, who are the students attending these schools with 4-year graduation rates below 50 percent? It may not come as a surprise that these schools educate larger proportions of black, Latino, and low-income students compared to public high schools overall. The yawning gaps in graduation rates between black and Latino students and their white peers has been well documented. The chasm between white students’ grad rates and those of students of color and low-income kids is clear when looking at the public high schools that are not charter schools. As you can see in the chart below, non-charter high schools with graduation rates below 50 percent educate a significantly larger share of black and Latino students, and a far smaller share of white students, than non-charter high schools where more than 50 percent of students earn a diploma within four years. But the differences in the student makeup between charters with graduation rates under and over that 50 percent threshold are much less stark. Charters that graduate at least half of their students enroll similar proportions of black, Latino, and white students as their charter school peers that graduate less than half of their students. Charter high schools enroll smaller shares of white students and higher proportions of students of color compared to public high schools overall. Just News from Center X is produced weekly by Leah Bueso, Anthony Berryman, Beth Happel, and John Rogers. Generous support from the Stuart Foundation allows Center X to provide this service free to the general public. Sign up to receive the weekly Just News email.